Hack repair on board. Not sure it's the problem. Pull fuse F109 and check with a meter. It looks blown. @LTB that was it! Holy cow! Such an easy thing that I have made so hard haha. Thank you so much! On a separate note while I was looking around back here I do not see a battery pack. My game saves everything fine and keeps high scores. If anybody has info on what is going on here I would really appreciate it. Sorry I’m a newbie. If anybody has info on what is going on here I would really appreciate it. See the board below your star trek game ROM ? That's a NAVRAM add on. It's magic. Replaces the batteries. No need to be sorry. We all started somewhere. You'll do fine. LTG thanks again! I wanted to make sure they weren’t hiding and rotting away! I take it back... after having the machine on for about an hour or two and not playing it the fuse burned out again. Not really sure where to go from here. Find the why. May take some time. Bad bulb ? Bad socket ? Something shorting to wiring ? Since it's in the backbox, easier than all over the playfield. I'd remove all but one light bulb. Then keep the game on, and replace one every hour until you narrow down the bad socket/bulb. Check that your fuse is a slow blow and the right amp. Alrighty. So finally got the correct fuses and replaced the and wanted to make sure all of my gi was working first. Ran a test and it looks like only half of the lights are working. All of the lights that are connected to the solid yellow wire and the white and yellow striped wire are not working. 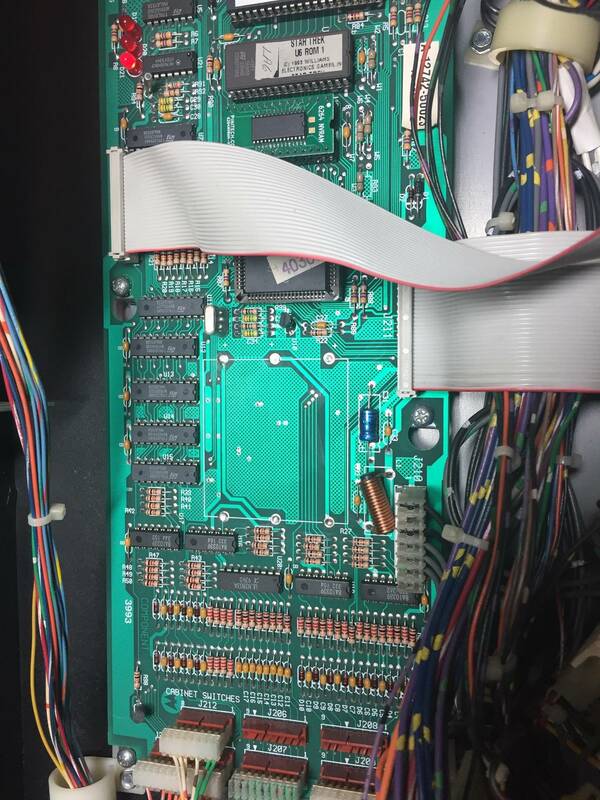 After turning the game off I wanted to make sure that the fuses were placed back in properly and the fuse for f109 was extremely hot after about 2 min of the machine being on. Is this any clue to what could be going on? I have not done what ltg said to do yet. I just turned it on to make sure they were working. Thanks again! I'd remove all but one light bulb. Then keep the game on, and replace one every hour until you narrow down the bad socket/bulb. Is this any clue to what could be going on? Fuse is hot means too much current, I'd suspect a bad bulb, bad socket type thing. So over the past two days I have done what ltg suggested testing each bulb and socket and no hot fuses. So then I started putting one light bulb in at a time and waiting a little and after putting 5-6 light bulbs in on the same string of wires we got heat from the fuses. I did check how much power is going into the sockets and was getting readings of 6.9 or 7.5 on the orange and white lines. On the yellow lines I was getting 6.4 or 6.3. I do not if that is any clue where to go from here. I have made sure the fuses are new, they are getting power, the wires are getting power, the sockets seem fine(unless those are high readings), and the light bulbs seem good. It may not be connected but could anybody tell me more about the solder job that was done on the board? I’m not sure what that is there to do. The picture is in the first post and thank you all again. Swap J120 and J121, if fuse gets hot then it's something on the board, maybe the solder. If a different fuse gets hot, then it's out in the game. This is pretty common. 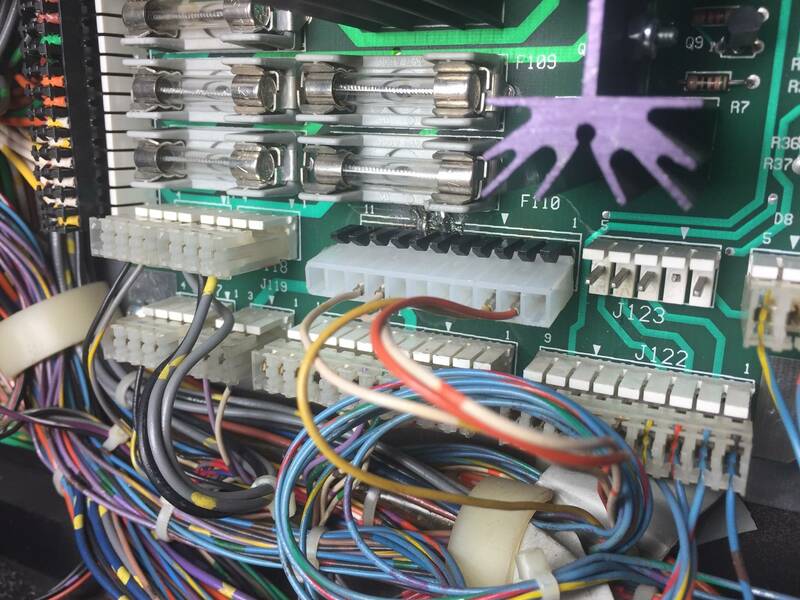 I had a whole host of issues with my game until I swapped the connector from J120 to J121. They're designed in parallel, so they provide the same functions. pahuffman ltg wellll I switched them and the same two fuses got hot so something on the board. Is this something where I can replace small parts on the board or just get a new board? 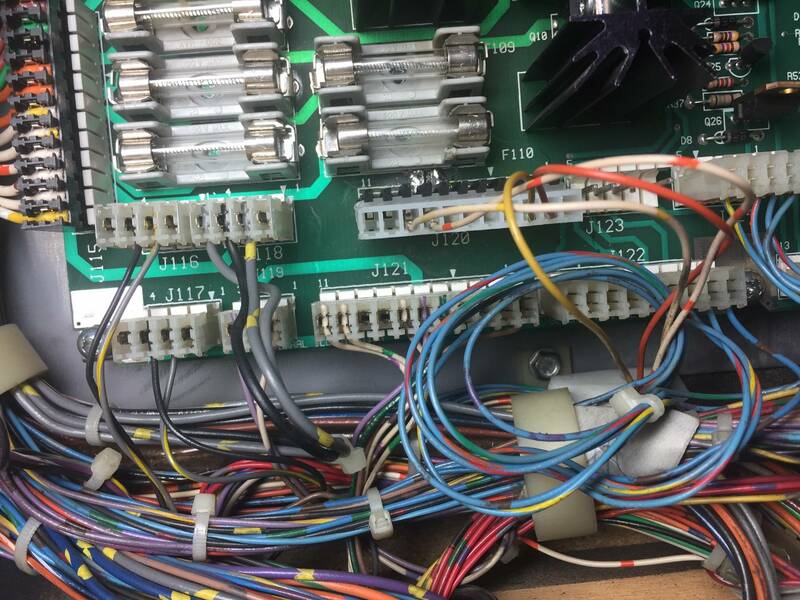 I also had read in one of the forums that somebody had wired all the wires to J121 and that you just have to disconnect them if you take backboard off the machine. Is this a safe option? I feel like that puts way more strain on those fuses but I’m still learning about all this. Is this something where I can replace small parts on the board or just get a new board? Depends on what is wrong with it. AC power goes in on theft side across the lower left area and out to the GI lines. If wiring in is fine, I'd pull the board and inspect the lower left area for solder blobs and shorts, etc. Have a look at the fuse clips. Is there good spring tension? Are the contacts clean and bright metal? Both legs of the clip solid and not broken? Might be worth using a sanding pen or a green scrubby to clean the fuse contacts and the fuse clip contacts. Gently bend the legs slightly closer together after cleaning to tighten them up. 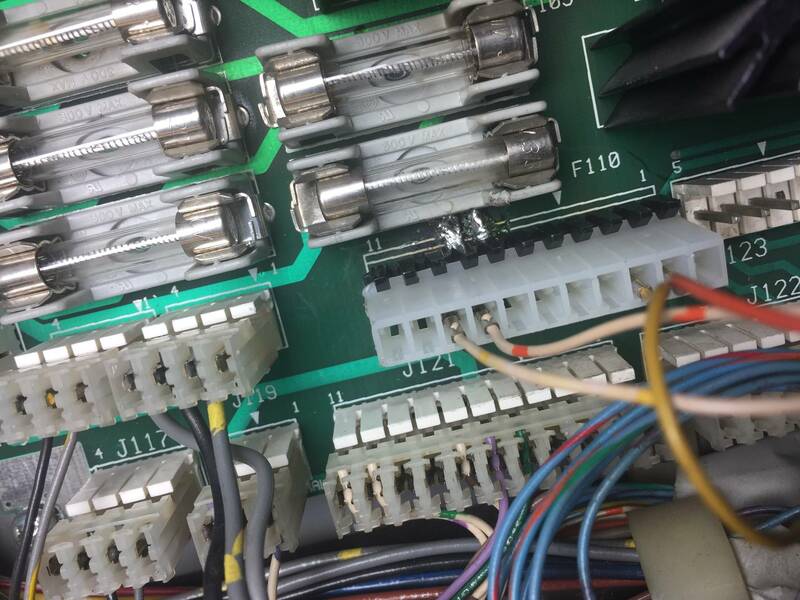 When the fuse or clips get oxidized or corroded, or the spring tension weakens, or one of the legs of the clip breaks, the resistance of the connection generates heat. The heat weakens the spring tension of the clip making things worse. If your fuse holders look like they got hot (melted, yellowed), best long term fix is to replace them. Changing to LEDs should also alleviate the problem as they draw less than 1/4 the power. That depends on your situation. If you're keeping this game and are new to board repair, it would be easier to just buy a new board. You have to remember that the original boards are 25 years old now. Boards manufactured today are significantly more efficient and robust than the original system. Keep in mind you'll have to buy a new NVRAM ($20) because it looks like the one you have is soldered directly to the current board. If you're trying to flip the game for a quick profit, it would be worth trying to source the issue and repair it to maximize your return. could anybody tell me more about the solder job that was done on the board? It looks like crap and is likely the cause of your problems. I've never seen a job like that before.